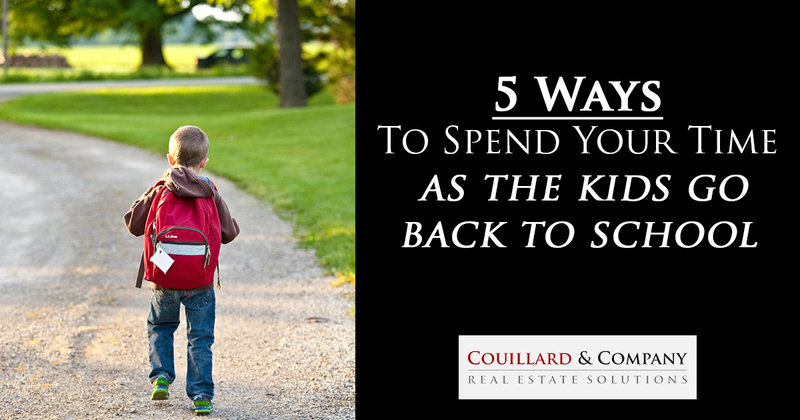 5 Ways To Spend Your Time As The Kids Go Back To School! We know, we know. There’s laundry to be folded, doctor’s appointments to be made and work to catch up on during the day. But, c’mon- there’s also celebrating to be done. You survived the summer and now the kids are (finally) back in school. Take some time to kick back and enjoy that newfound freedom (hello, happy hour!). You deserve it. As a mom of two young amazing kiddos, I’m relieved school is back in session. Don’t’ get me wrong, I loved the time I had with them this past summer, but let’s face it, I’m exhausted. Between our summer schedule, vacations, play dates, and my career- I feel as if finally need a break and structure! So off to work I go. Luckily, I have been blessed to work with an amazing Real Estate Team and work part-time remotely. I must admit- YES, I have days where I wish I could drop off the kids and get some work done, or enjoy a spa day, or catch up on some favorite tv shows alone. I wouldn’t change it for the world. For all those full-time stay-at-home moms, I have a few suggestions on what to do NOW- I’m super jealous of y’all so PLEASE at least do one of these things today!!!! I expect to receive a FULL REPORT and LOTS OF PICTURES!!! 1. Binge watch your favorite show during the day! It’s true. There’s more on TV these days than Daniel Tiger and Elena of Avalor (not that we don’t love watching those shows with our kiddos). Use this extra time to catch up on those shows everyone is talking about!!! We all deserve it, we all need it and we all crave it!!! There are other things to purchase besides Toys so skip the toy section! Spend a few hours looking at shoes, jewelry, and WINE! We don’t have as much time for our friends as we once did (remember those lazy Saturday afternoons at Pub II eating cheeseballs??) It is so important to not only see your BFFs on Facebook and Instagram. Schedule some time to get together. Sigh. This might be our best suggestion yet. And you all thought I was only giving you the TOP 5!!! Well, I thought it was only appropriate to recruit for my amazing company Keller Williams, Bloomington IL! 6. Be like me- a working Real Estate- Transaction Coordinator Gal!!! You are an independent contractor. You decide how much you’d like to work and how big you want your business to be. The harder you work, the more you will earn. There is no set salary. You have the opportunity to set goals of how much you want to earn each year. You have total freedom to set your schedule and work around your personal life. You will help your clients make one of the biggest decisions of their life. You can help someone’s dream come true.